Finally, after all of these months of being in a cast and being in pain, Jon was finally able to cook last weekend! 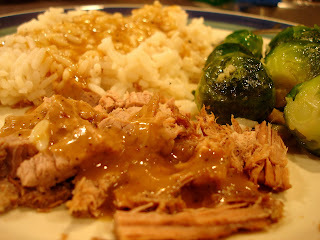 He was so excited to make one of his specialties, roast beef (eye round) with homemade gravy and rice. The last time Jon made this meal I tried to work out downstairs while he was cooking - big mistake! The aroma that comes out of that pot while he is cooking is incredible. All I can do is sit and take in the heavenly smells as I wait for dinner! Jon uses a pressure cooker to cook the roast. Rub these spices into the roast - salt, freshly ground black pepper, garlic powder, and onion powder. Sometimes he adds a touch of cayenne. Get your pressure cooker good and hot then sear the beef. Once seared, add a cup of water and close it up. It takes about 45-55 minutes to cook 1-1.5 lb roast. 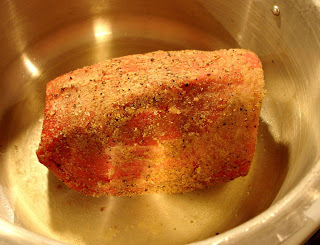 Once done, remove the roast from the pot and let it rest, keeping the drippings in the pot. Mix one cup of water with about 1 tbsp of flour. 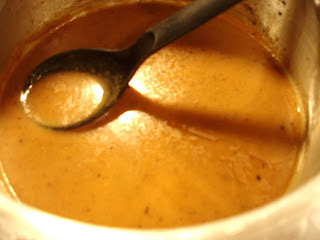 Whisk the water-flour mixture into the drippings. I contributed Brussels sprouts to the meal. Here is a recipe I like to use. This meal is the definition of traditional home cooking and I can't wait until he makes it again!